This is what is listed on my website commissions page as it relates to commissions for ALL artists. Purchasers of commissions receive only the physical copy of the artwork; no other rights are conveyed by this transaction, including rights of reproduction. Artist retains all rights in the artwork, including all copyright rights, and reserves the right to license or otherwise authorize the publication of the artwork by any other party for any reason, with no duty of accounting or any other further obligation to you. I was under the impression that Marvel or DC had to ask the fan who commissioned the artist... but apparently, not true according to Robert F, who had his Jim Steranko art used, but was not asked or notified. Imagine one day you go to the comic store and saw your commission on a comic book cover and had no idea how it got there? Legally, I guess they don't have to pay or ask permission... but it doesn't make it right. I've read an interview with George Perez a long time ago, that he stated that DC and Marvel grant him permission to draw their characters (even if he created them? ), but those artwork must remain private and not be printed in a publication. Anyway, I think all the fans who got their art used, I'm sure they're happy to learn that the artists gets paid again... and it just comes down to doing right to the creators. Cap by the great Jim Steranko! This image is copyright to Mr Steranko and is shown here with his permission. I contacted Mr. Steranko about this as I had heard he was accepting commissions. He quickly replied and we set something up. Mr Steranko was the ultimate professional and he kept me informed of the progress of the piece all along the way. The time lapse between the initial inquiry and the completion and shipment of the piece was less than 8 weeks which is ridiculously fast. It has always been a dream to own something done by Jim and I was not disappointed in the art itself (which will hang in my new office) or by the way I was treated. It was a GREAT transaction. I want to thank Mr. Steranko again (Love the ART!) and I also want to point out that I have received permission to show this in my CAF. I just saw that this is now one of the variant covers for Captain America 695! The War Of The Realms is coming out April 2019 with a George Perez variant cover. 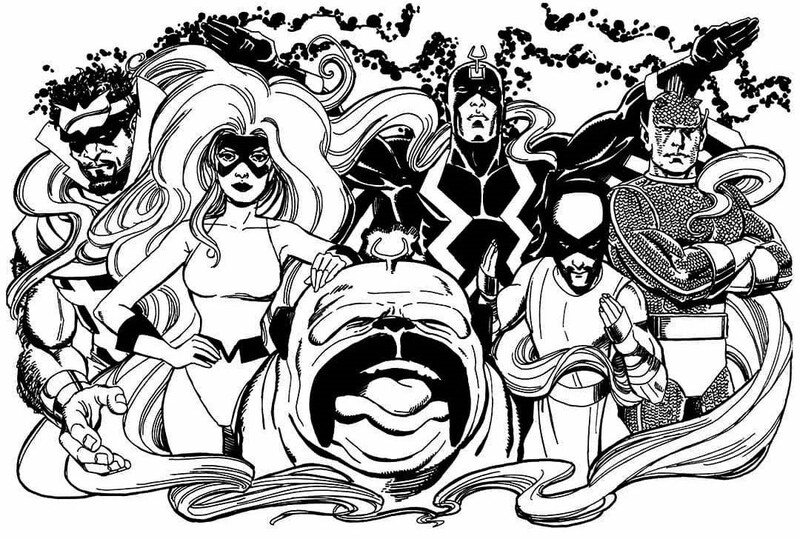 Personally speaking, I don't like how Marvel is just re-using these fan commissions (this one was done in 2009). The art is great, don't get me wrong, but they aren't meant for covers. George used to do "cover quality" commissions, but these are just Marker & Pencil tones. Anyway, I guess it's better to see George's art in modern comics rather than nothing... just my two cents. Media Release -- The War Of The Realms is coming…and no corner of the Marvel Universe will be untouched! Today, Marvel is excited to release two new stunning variant covers: one by artist George Perez (with colors by Jason Keith) and one by Ryan Ottley (with colors Nathan Fairbairn). This April, all hell will break loose as Marvel's epic event from the award-winning creative team of Jason Aaron, Russell Dauterman, and Matthew Wilson usher in an event of unparalleled scale! Plus, don't miss a special midnight release of WAR OF THE REALMS #1 for retailers – be sure to check Marvel mailers for details! This April, Marvel's WAR OF THE REALMS commences, brought to you by the superstar team of Jason Aaron and Russell Dauterman and featuring Marvel's greatest heroes such as Thor, Captain America, Iron Man, Spider-Man, Black Panther, and Captain Marvel! The dark sorcerer Malekith wages a war that has spread from one otherworldly realm to the next, razing each one to the ground as his armies move from conquest to conquest. Now there's only one realm left standing: ours. Nightmarish creatures and wicked warriors from across the Ten Realms are all converging on Midgard, and it will take the combined might of the Marvel Universe's greatest defenders to prevent them from conquering Earth! Jason Aaron has been setting the stage for this story for more than half a decade, and the ramifications will reverberate throughout the Marvel Universe for years to come! And don't miss a special midnight release for WAR OF THE REALMS #1 in April!